At times I wonder precisely when it will be that I morph into a wise soul and instinctively know when to hold ’em, know when to fold ’em. Or in this case, know when to walk away, know when to run. A couple of days ago, I was on the edge of my seat (in a running after kids, doing stuff way) with excitement, because all was clear for an evening crafty session with my Quilt Project square. The words of the wiser-than-wise owl Christie echo in my ears as I type: “no craft is safe when you are tired!”. After a few nights of a few hours sleep, I discovered that the involvement of fusible webbing is no exception. One would have thought that watching the iron slowly scorch the canvas would cause me to have a PULL OUT, PULL OUT, YOU’VE HIT AN ARTERY! moment. Alas! Alack! Non. I’m sure whole seconds passed as I watched in fixated horror and fascination. 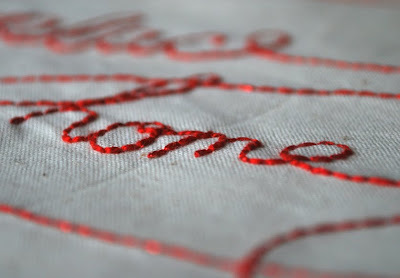 After a minor meltdown (it’s not only where the marks of my air erasable pen were – there’s a general sort of old-man-undies, beige tinge going on), I then attempted redemption with the teensiest of fairy buttonhole stitches around the edges of my satin house. It took hours. I loved it. I should have been sleeping. Back to the iron to do more fusibly webby stuff and voila! A great whopping strip of wayward fusible gunk stuck to an entire house worth of perfect stitchery. Refer back to that top pic to get the gunk gist. With the words of The Gambler ringing in my head (as it so often does), I went to bed. 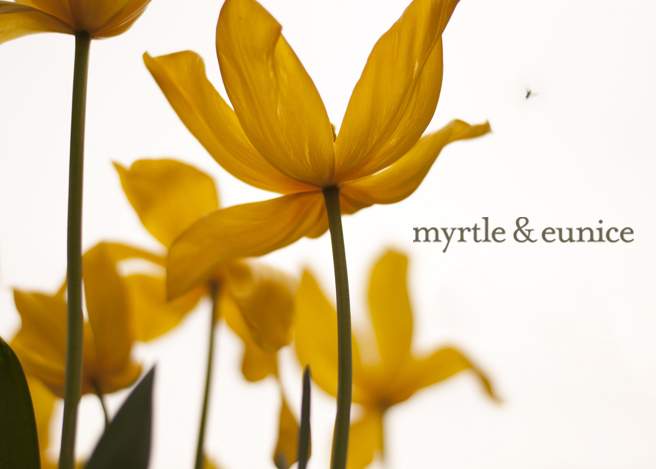 The following evening, I had a small child on my lap and then crawling on to my head, so Take Two on the house involves neither buttonhole, nor fairy. It’s more a blanket sort of stitch designed by horses. ...I’m thinking I may need something more. I figure my best bet may just be to keep my square moving. Or present it the way kids show you stuff, by thrusting it 3cm in front of your eyeballs. I can see there remain some issues to nut out. PS. Does any kind and knowledgeable soul out there, have a top tip for the removal of singed, obviously-no-longer-air-erasable-fabric-marker-pen on canvas (nice try, Tania)? Preferably one that doesn’t involve the words ‘start’ and ‘again’? oh, I really hope it all works out. I have that sick feeling in my gut for you. I'm sure though that it probably doesn't look as bad as you think it does. If you know what I mean. Anyway, fingers crossed there is some knowledgeable soul out there who will come to the rescue! Tarn, I really feel for you and wish I had some words of wisdom to part! Alas I can't help with this one:( Will ask around..
You are talking to the totally inept when it coems to fabric burn. On a brighter note, those glitter balls look sen-bloody-sational! Oh Tania! My heart goes out to you! I found this link that might help. Going on the advice in the link Hydrogen Peroxide is the way to to. I also thought about the possibility of mixing a bit of bleach and a bit of water together and painting it on but you'd want to be VERY careful. I really hope it works out for you. I'd hate for you not to finish! "the marks will vanish without washing, but do not iron the over the marks as it will set the marks and they cannot be removed." Bugger, bugger, bugger. I hope Melanie's suggestions are the answer. 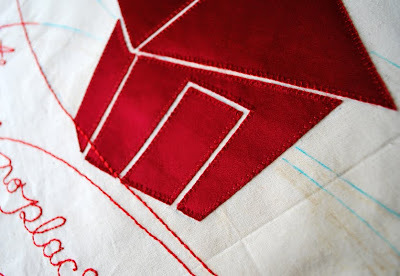 If not, is there any possibility of appliquéing the done parts of your square onto a new square? Could you cut them up so it looks deliberate? 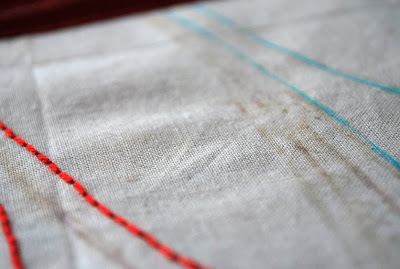 If Kirsty has a spare square (I have everything crossed), you could use a blanket stitch in calico-coloured thread to attached the two together... maybe?? 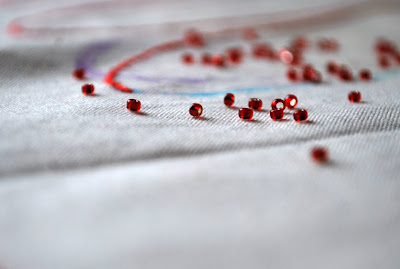 Even if you have to do a little bit more stitching? I am sure Kirsty would give you an extension if it is at all possible. Heartbreaking !! Would more embroidery stitches and those lovely beads be enough to cover the lines but not swamp that great design ? 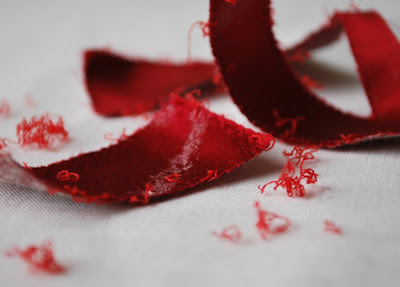 And test a sample of red thread and canvas with hydroge peroxide first ,obviously . Good Luck ! Tragic news. It's is such a beautiful design and so much work already. I've got my fingers, toes and eyeballs crossed for you. You have to undo 'the old' men undies tinge. Wish the word verification had told me how. It surely must be a good sign? Oh lovey! Bummer bummer ... but is it possible to embellish, embellish, embellish?.. white sequins? Where's the frickin good witch when required? my mum always says hair spray for ink ... but in this case i dunno ...? in the meantime i hope you get some sleep! Di you consider the spot clean kit that you can find in supermarket it is more like dry cleaning kind of option I guess...you can also find some whitener(Safer than bleach solution)?I am not sure I can really picture what you need to do?The photos you posted looked terrific...I hope you find a solution it seem absolutely beautiful Tania. Ouch! I feel for you and identify with you too. I hope some of these suggestions work. I'm sure I'll be trying them out soon too. Your photos of your mess are lovely if that makes you feel any better. Oh no!! My Mum used a pink transfer pencil on a recent Christmas stocking project and had the transfer paper move as she ironed it, leaving a nasty, hot pink double image. She tried just about everything she could think of to get rid of it, cold water, bleach, etc and unfortunately had no luck. In the end she just went over the double image with some golden thread. Not really an option in this case, but I'll cross my fingers that you come up with a solution. Please share if you do!! From what I've seen so far, you've done a fabulous job! Yes! I would consider myself a kind and knowledgable soul.....but unfortunately for you....in this circumstance it doesn't extend to advice on singed marker pen on canvas! Good luck with it. It looks great otherwise. I'm hoping and praying that it's all fixable! Sorry, I offer no advice at all on this sewing caper... good luck with that one. And Curly Pops - your comment rocks too! oh dear, i can sympathise. i have been known to leave wet prints on the table only to come back and find beautiful little cat paw prints across everything! you never count your money, when your sittin' at the table! I'm still trying to figure out just why you're getting around in old-man-undies... but I may have read that wrong – it's been a long week. Can count on you for the most entertaining narration of a catastrophe AND to provide the song most likely to stick in your head. You're a gem. I am doing the slow motion, low pitched N-o-o-o-o-o-o. I thought only I did such things. Now I have read somewhere that rubbing a scorch with the side of a coin works. I have everything crossed for you too! Oh you poor thing , I know your stomach is churning now but funny how these things do work out . You'll work something . uh oh....have you tried Shannon Lush?? I vote for the sparkly glittery bits solution. When you land yourself in a mess, I find that a good coverup works wonders. ;) Good luck! Oh, how frustrating! Your block is really beautiful. I feel your pain about the time crunch, since my husband just finished his block last weekend, for the long boat ride from the US. Best of luck in deciding how to cover this. :) It really is lovely. It's a house, right? Embroider along the burn lines and call em powerlines. And thanks for putting that song in my head. Eeek, good luck with the camouflaging and getting more sleep! Oh, I feel for you! :-( I hope you can work something out... sometimes the things I do to cover up mishaps work out better than my original plans... but you original was already fantastic. Maybe you can cover up with more stitching and the lovely beads? Tornados must be wild, extra wind... I was taught that lemon juice removed ink stains, but not sure if it'd work with marker pen. Fingers crossed for you, Amanda.